I'm on a roll! LOL.. Anyway I took up creating nail polish jewelries again recently and I have one of my creation to show today! Isn't it gorgeous? 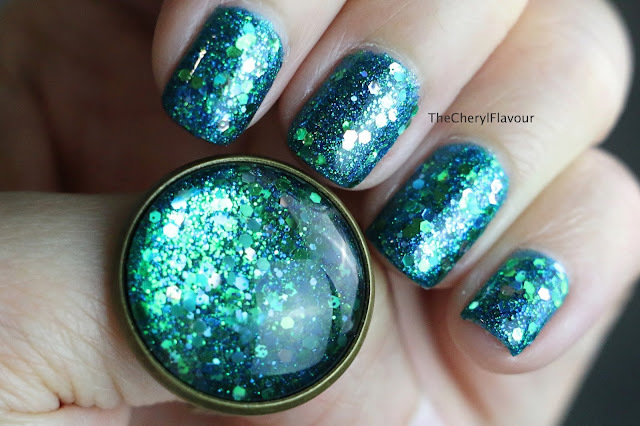 I named this Mermaid Tale because the colour layering reminds me of a Mermaid. And another 1.. Just to show off it's beauty. I actually created this on the ring first and thought it would totally make a cool mani so I duplicated it on my nails again for these photos. I loved this effect but it did took many layers to create this and it feels kinda thick on my nails. I mean there's a total of about 7-8 coats here and some of them are thick glitters! Do you guys mind thick manicures? Does it actually last longer when it's thick anyway? Haha.. 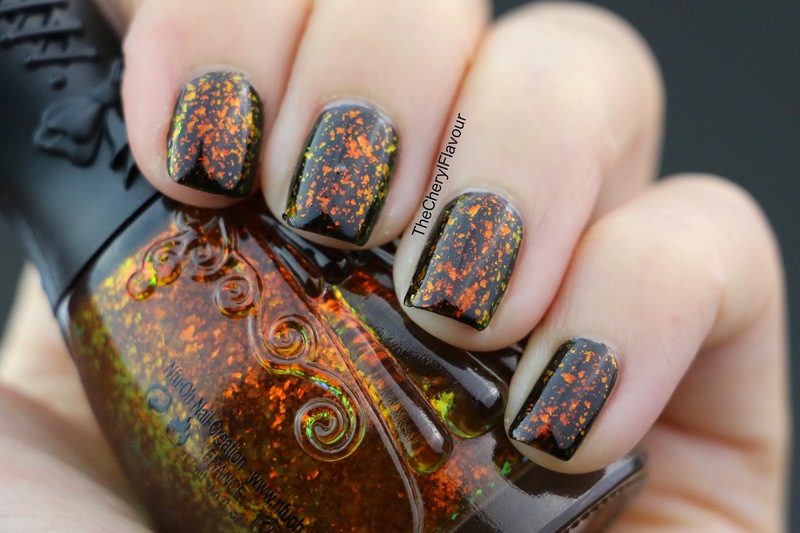 Here's another 1 of just the mani! I'm gonna go and crack my head to think of new designs now. See ya all next time! OPI Soft Shades 2016! Full of Pastels! I'm excited to show this collection today and it's the OPI Soft Shades 2016 collection! OPI Soft Shades 2016 is a 6 colour collection full of pastel colours! Yeah! My favourite favourite favourite colours and they are all so beautiful! Seriously I can't get enough of them. Even though I probably already have dozens of similar shades in my stash, I still can't resist grabbing them all. I will never get bored of pastels! Overall I think the colours are beautiful, but the application needs a little work. They are a little sheer and streaky at first, but will even out with more coats. I used 3 coats for all of these. A bad idea to use 1 of the pastels as the colour for the tips though, as it needed a lot of coats to cover the base colour. In the end it looked kind of thick and gets smudged easily. I accidentally bumped my index finger while looking through my polish stash and you can see the imperfection there.. Haha. Hey ladies! Today I have swatches of the new OPI Hello Kitty Cherry Blossom Collection! This is a limited edition collection consisting of 4 girly & basic shades. I haven't seen much swatches of these around so I thought I'll do 1 on my blog! OPI Showered By Petals is a pretty basic off-white creme polish. The polish looks very close to pure white but when you compare the polish side with side with a pure white polish, you can see that OPI Showered By Petals is very slightly greyed. Just a very very light hint of grey. OPI Showered By Petals have a creamy application and is not as opaque as pure white polishes. OPI Dreams Of Spring is a pale light pink creme polish. The application for this polish is a little streaky and took 3 coats for me to even it out. OPI Sitting Under Cherry Blossoms is a jelly pink polish with pearly shimmers. A sweet girly shade that really does reminds me of Cherry Blossoms. OPI Cheery Blooms is a bright tomato red creme polish. 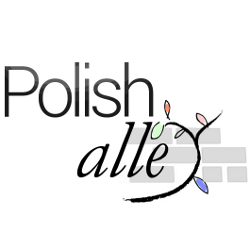 The application for this polish is awesome. Very smooth and opaque. You can easily get away with 1 coat with this polish but I like to apply at least 2 coats for the creamy & fuller look. Even though this is a limited edition collection, I do feel that the colors are all very basic and common shades. Hi Everyone! 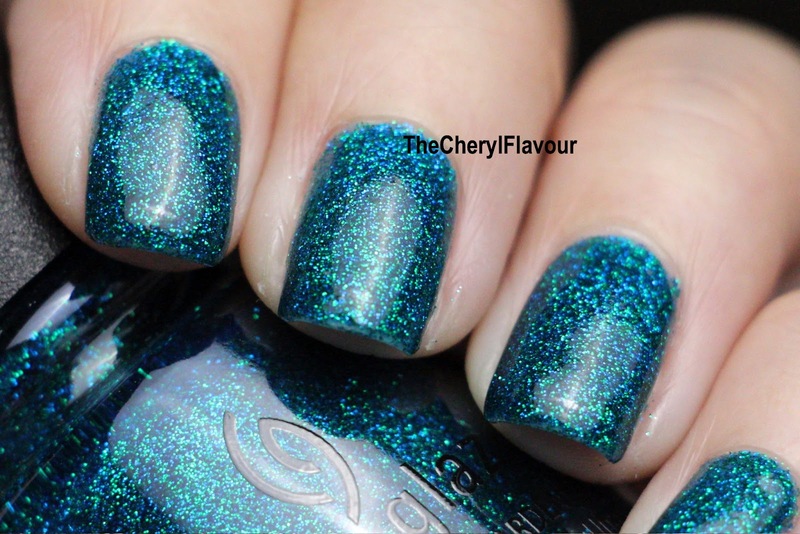 A new China Glaze collection have just landed on Singapore shores but when I did a search on them, I couldn't find much information so I decided to do a swatch post! 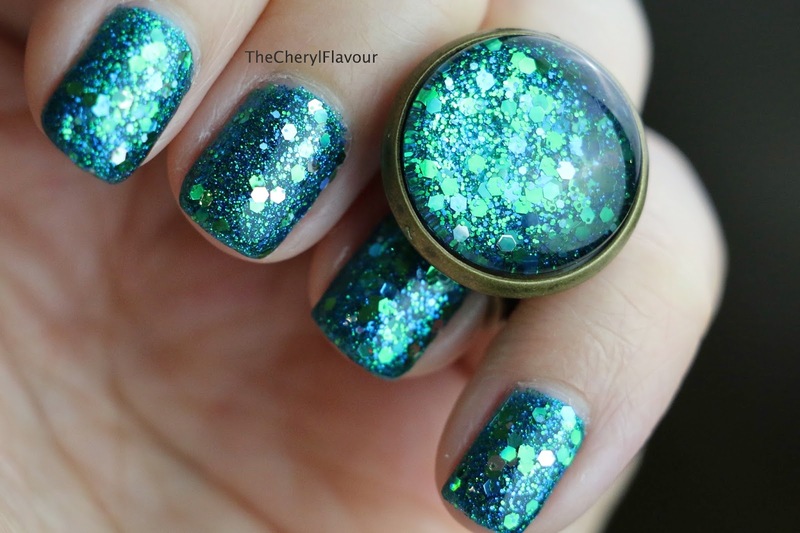 China Glaze Star Hopping collection is a 8 bottles glitter bombshell collection! From what I found out online, it was released as a Sally exclusive earlier this year. Not sure why it only came to Singapore now, but I think there are too little swatches and attention on this collection because all the colors are really super super gorgeous! China Glaze Give Me The Green Light is filled with green & blue micro glitters in a turquoise jelly base. Close up shot. This is one of my favourite in this collection! China Glaze Silver Of Sorts is filled with different sized silver glitters in a clear base. 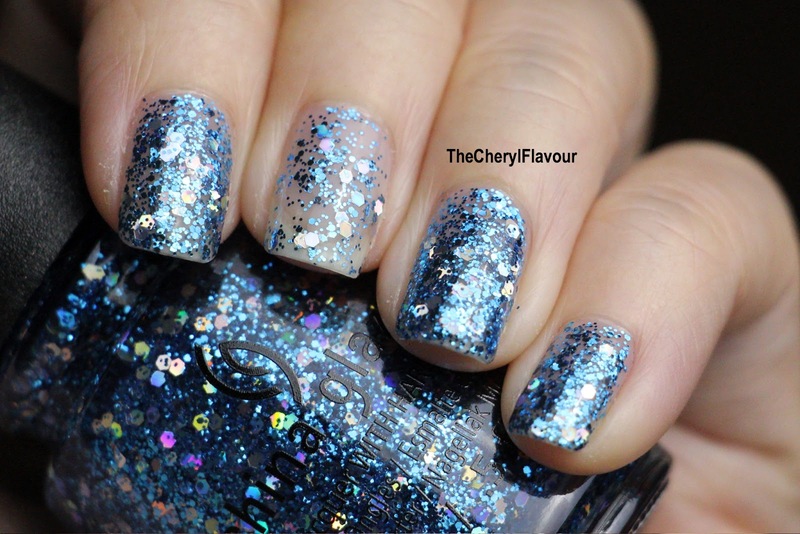 A more common glitter but still good if you don't have something like this. 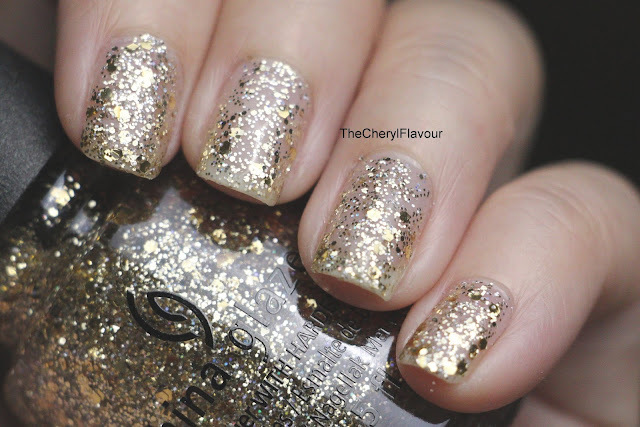 China Glaze Counting Carats is filled with different sized gold glitters in a clear base. This is the equivalent of Silver of Sorts but in gold. 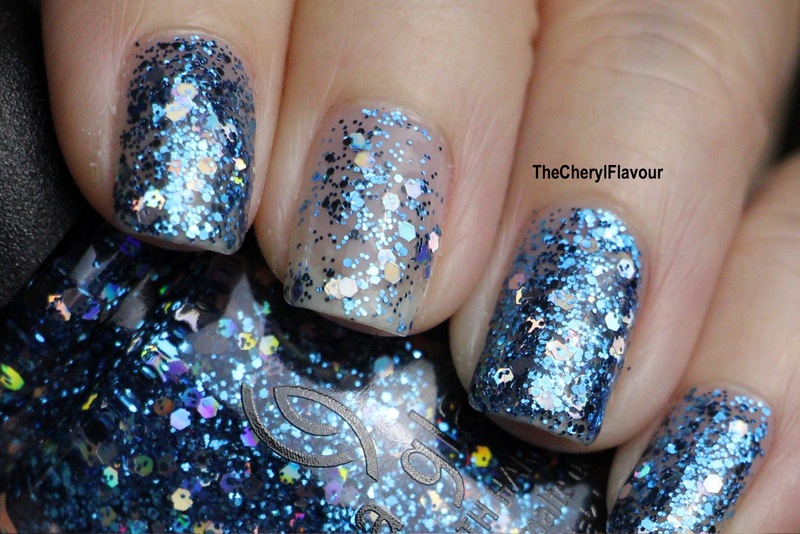 China Glaze Star Hopping is filled with navy blue & silver holographic glitters in a dark blue jelly base. I'm still having problems with taking photos of dark polishes.. It is much prettier in real life. China Glaze Turn Up The Heat is filled with pink, purple and silver glitters in a magenta pink jelly polish. Another one of my favourite of the collection! China Glaze Can You See Me? China Glaze Can You See Me? is filled with different sized aqua blue glitter and holographic glitters in a clear base. One coat on the ring finger, and two coats on the rest. China Glaze Pick Me Up Purple is filled with lavender purple & silver holographic glitters in a clear base. China Glaze You're Too Sweet is filled with baby pink and some holographic micro glitters. This is two coats. Kind of like a more dense & pink version of China Glaze Fairy Dust. Coming up, I also have the China Glaze Cheers! collection (Christmas 2015 collection) with me waiting to be swatched! Very excited to get my OPI Color Paint collection cos I've heard/read so many great things about them! I absolutely adore my OPI Sheer Tints so I'm quite happy that now I have more shades to play with. One thing to note is that the Color Paints are mostly much more opaque than the sheer tints collection. For my manicure today, I used a nail art brush to dap the colors from the OPI Color Paint collection on to my nails to create a water color kind of effect. I think it looks a little like tie-dye too which is actually quite pretty! 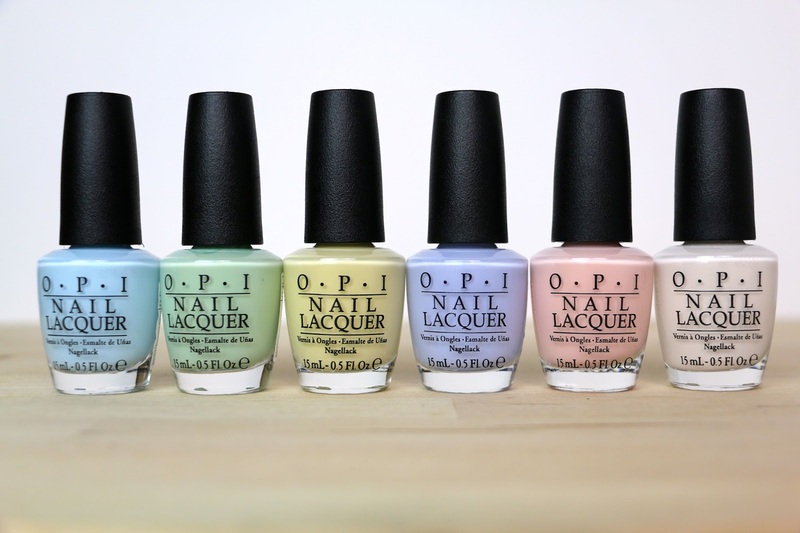 Have you gotten your OPI Color Paints collection too? Leopard prints are my go-to nail art. 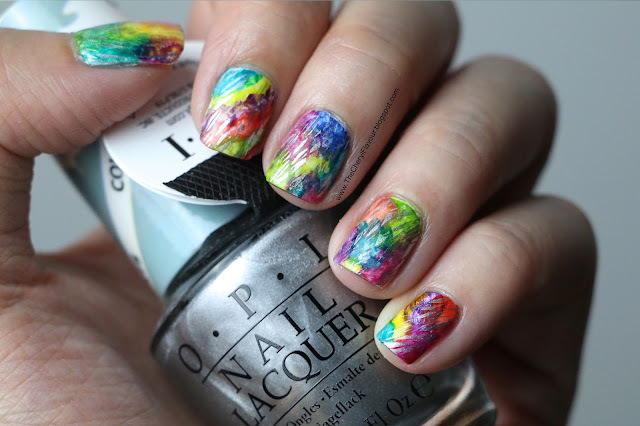 They almost always look gorgeous and complicated but they are actually one of the easiest nail art to free hand. For my funky leopard print today, I used China Glaze UV Meant To Be from the new China Glaze Electric Nights collection as base, and did the spots with China Glaze Sun Of A Peach and China Glaze Liquid Leather. China Glaze UV Meant To Be is an enjoyable medium blue that is slightly darker than sky blue. Application is great. Creamy yet not too thick. I used 2 coats for this. China Glaze Sun Of A Peach is an old polish already, but I do like how opaque and pop this color is. These kind of polishes are really great for nail art since they are opaque enough to cover almost any color with 1 coat. Hope you like my funky leopard prints today. Tell me what are your favourite go-to nail arts! So I've been gone for awhile... not even sure if anyone is following this blog anymore.. But the truth is I've moved to a new place at end January and my new house doesn't get as much light.. And due to that, I've had been having problems with taking quality picture and so I don't really have much motivation to do my nails after that..
Now the problem is solved! Determined to continue doing my nails and sharing them with everybody, I went and got myself some studio lightings.. LOL.. So now I can take nice & bright nail pictures at any time! 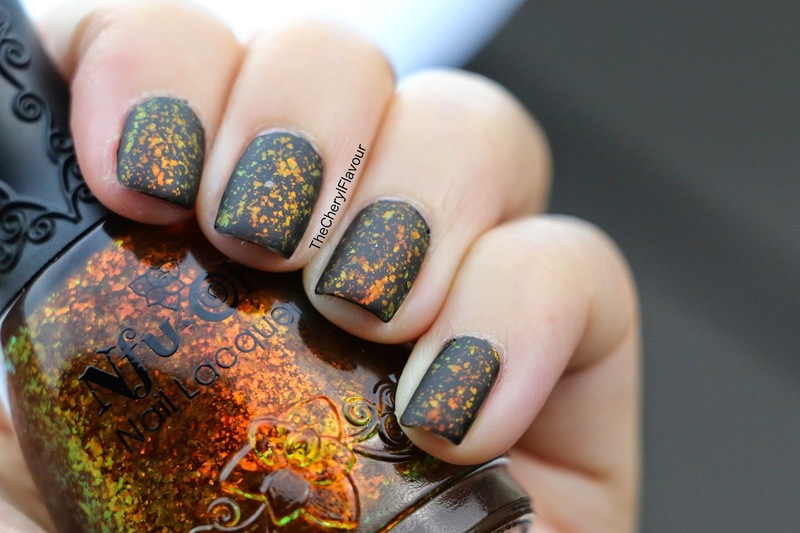 Here's some good old multi chrome flakies to celebrate! The only small imperfection is that I felt that the bright lights kind of lightened the black so I decided to mattify them. I think it's even better after a layer of Matte Top Coat! Seriously! What do you think? Do you prefer these glossy or matte? I finally got the remaining colors swatched! Here are the rest of the 6 colors from set 'Road Trip Ready' which consist of some straight cremes and some shimmery cremes. First up is China Glaze Pinking Out The Window. China Glaze Pinking Out The Window is a very pretty salmon pink creme polish. 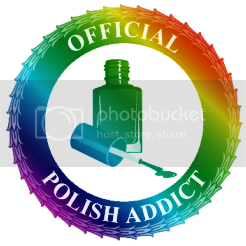 I like how this polish look on my skin tone! This is the kind of pink I like.. Very flattering and versatile. :) Formula is great too. China Glaze Dashboard Dreamer is a very soft light blue polish with pearly shimmers. This reminds me of a darker version of OPI I Vant To Be A Lone Star, and a shimmery version of China Glaze At Vase Value. Formula-wise, this polish is a little sheer and needs more coats to be opaque.. Think I applied about 3-4 coats for this. 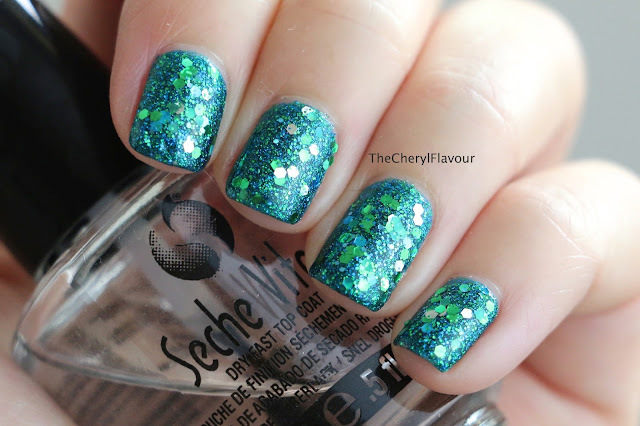 Shimmer is very soft and more obvious in bottle but hardly visible on the nail. China Glaze Boho Blues is an indigo blue straight creme polish. This kind of periwinkle blue is my favourite kind of blue! China Glaze Pack Lightly is a light peach polish with very soft shimmers.. Infact, the shimmers is so subtle that it's really hardly visible at all. This type of orangey colors is really not suitable for my skin tone.. :( Don't you think it makes my skin looks dark and dirty? China Glaze Wanderlust is a light pinkish purple polish with soft shimmers. I feel that the polish looks more purplish in the bottle but more pinkish on the nails. Like most of the other shimmer polishes in the collection, the shimmers in this polish is very soft and kind of totally not obvious on the nails. Formula is okay but need some work to even it out. Finally it's done! What do you think of this collection?